Midfielder Shelvey was not punished by referee Andre Marriner during the game. The 22-year-old faces a four game ban if found guilty and has until 18:00 GMT on Wednesday to respond to the charge. Liverpool winger Raheem Sterling, 20, has not been charged for an incident involving Swans’ Federico Fernandez. BBC Wales Sport understands that Swansea are furious with Marriner’s claim that he did not see the incident, which was caught on video. Monk, who had said before the game that Shelvey needed to “wise up” to improve his discipline, said there should be no retrospective punishment. 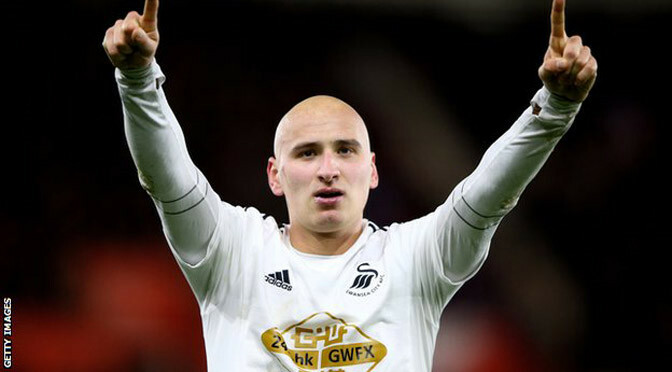 “Jonjo said to me his intention was not to catch the player at all . . . It’s not clear. There was a motion towards the player,” he said. Sterling has not been charged for pushing Swans defender Fernandez in the face as the incident was seen by at least one of the match officials at Anfield, so no further action will be taken. Liverpool moved to within five points of the top four with an emphatic victory over Swansea at Anfield. The home side took the lead through Alberto Moreno’s close-range finish. 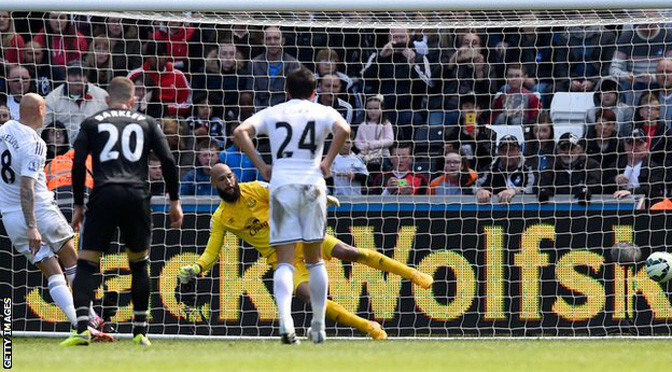 Adam Lallana made it 2-0 when Lukasz Fabianski’s attempted clearance struck him and found the net before Swansea’s Gylfi Sigurdsson hit back immediately. 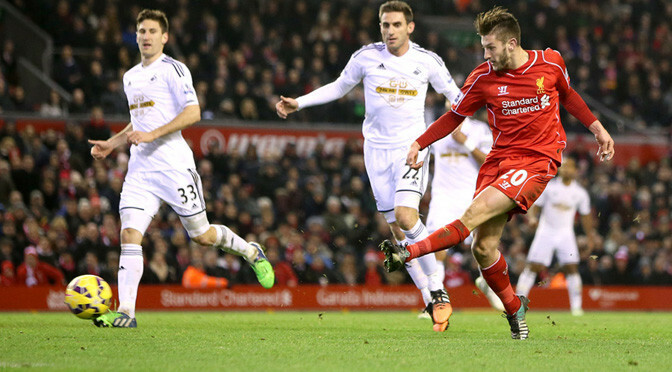 But Lallana struck again with a low finish and Jonjo Shelvey’s headed own goal from a corner sealed the rout. It could have been worse for Swansea, with Raheem Sterling striking the post with a shot from an angle and substitute Mario Balotelli drawing a good save from Fabianski with a low drive. It has been a year of two halves for Liverpool, who began 2014 with drive, purpose and a 16-game unbeaten run to take them to within a whisker of an unexpected Premier League title, but in the last few months have been characterised by doubt and inconsistency. Aptly, this was a game of two very different halves, with a slow-paced and unmemorable first period giving way to a dynamic and entertaining one after the break. Liverpool were the better side in both – especially the second – to ensure they end the year with back-to-back victories that lift them up to eighth in the table, five points behind fourth-placed Southampton. Without the injured Daniel Sturridge, the Reds still lack strength up front, which was most apparent in the stale 33 minutes before Moreno darted into the box to finish Jordan Henderson’s low cross to give them the lead. But, in spreading three of his quickest and most skilful players – Lallana, Sterling and Philippe Coutinho – across the forward line, manager Brendan Rodgers has at least discovered an effective alternative. And with Henderson and Lucas putting in the hard yards behind them, Rodgers was vindicated in his decision to leave out captain Steven Gerrard, who had started all seven of their previous fixtures this month. The pick of the bunch was Lallana, who put a poor first-half miss behind him to assert himself decisively on the game. His first goal owed a lot to fortune, with Fabianski’s kick deflecting off him and looping into the net, but it also illustrated his desire through his willingness to close the keeper down in the first place. In contrast, his second – a decisive blow after Swansea had gained a foot-hold in the game through Sigurdsson’s close-range finish to make it 2-1 – was chiefly down to his ability as he collected a neat flick from Coutinho, beat two men and finished low. The Reds were assisted by Swansea, who have practised the high-tempo, high-pressing game Rodgers is trying to rediscover at Anfield to superb effect this year but were uncharacteristically limp and wasteful in possession. The visitors’ biggest crime was a failure to regularly test home goalkeeper Simon Mignolet, who had been dropped “indefinitely” by Rodgers due to his poor form but was brought back following an injury to his replacement Brad Jones. Bafetimbi Gomis did strike the bar with an 18-yard shot late on but by then they had already gifted the hosts an unassailable lead through former Liverpool midfielder Shelvey’s near-post header into his own net from Henderson’s corner. 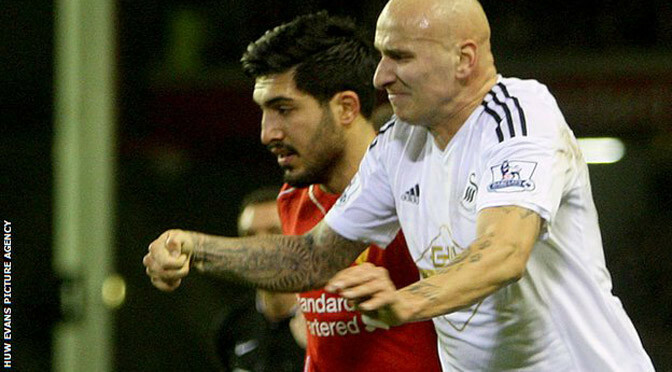 Shelvey was also involved in an incident earlier in the game when he caught Liverpool’s Emre Can with a flailing arm.